Effectuation is a logic of entrepreneurial expertise. What makes great entrepreneurs isn’t genetic or personality traits, risk-seeking behavior, money, or unique vision. Effectuation research has found that there is a science to entrepreneurship and that great entrepreneurs across industries, geographies, and time use a common logic, or thinking process, to solve entrepreneurial problems. Effectuation is a logic of entrepreneurial expertise that both novice and experienced entrepreneurs can use in the highly unpredictable start-up phase of a venture to reduce failure costs for the entrepreneur. See this link for a short animated quick and easy overview of effectuation. Aspiring entrepreneurs in MBA classrooms have long been taught the principles and tools of causal reasoning–the exact inverse of the effectual reasoning that drives entrepreneurial success. Using causal reasoning, one begins with a specific goal and a given set of means for reaching it. Using effectual reasoning, one starts with only a set of means; in the process of deploying them, goals gradually emerge. Expert entrepreneurs believe that the future is shaped by people. They believe that if they can make the future happen, they don’t need to worry about predicting the future, determining perfect timing to start, or finding the optimal opportunity. 1. Bird in Hand Principle – Start with your means. Don’t wait for the perfect opportunity. Start taking action, based on what you have readily available: who you are, what you know, and who you know. 2. Affordable Loss Principle – Set affordable loss. Evaluate opportunities based on whether the downside is acceptable, rather than on the attractiveness of the predicted upside. 3. Lemonade Principle – Leverage contingencies. Embrace surprises that arise from uncertain situations, remaining flexible rather than tethered to existing goals. 4. Crazy-Quilt Principle – Form partnerships. Form partnerships with people and organizations willing to make a real commitment to jointly creating the future–product, firm, market–with you. Don’t worry so much about competitive analyses and strategic planning. 5. Pilot in the Plane Principle – Take the wheel. By focusing on activities within your control, know that your actions will result in the desired outcomes. An effectual worldview is rooted in the belief that the future is neither found nor predicted, but rather made. Effectuation isn’t a static, one-time exercise. It is a logic and process that can be used as your business develops in the “0-60mph” (early startup) phase of growth. Expert entrepreneurs follow the process to gain early customers and committed partners who then create new means and new goals as resources and viewpoints are added to the mix. Thus, instead of having a stated goal and finding means to reach it, expert entrepreneurs use the new means and new goals to drive the creation of the venture in ways they hadn’t expected, leveraging surprises as they present themselves. Effectuators use the process to lower the risk of the venture (by getting customers and income early, setting affordable loss, and spreading risk to others) and finding truly new and useful market opportunities by leveraging constraints, contingencies and new information. Effectuation is a method that anyone can learn and use to decrease the risk of starting a venture, “fail” more effectively, use fewer resources, and become “expert” in entrepreneurship more quickly. “Effectual logic” can be used as the fuel to create more effective “experiments” by entrepreneurs testing their theories in the real world. The following technical notes are useful as both a primer for effectuation and put to work in the classroom during a full entrepreneurship course on effectuation. What Makes Entrepreneurs Entrepreneurial? – An easy 8-page introduction to the key elements of the theory and its application. The Five Principles and the Effectual Cycle – A more visually-appealing look at the principles and cycle. Affordable Loss and the Plunge Decision – How do entrepreneurs decide to take that bold move into starting a new venture? 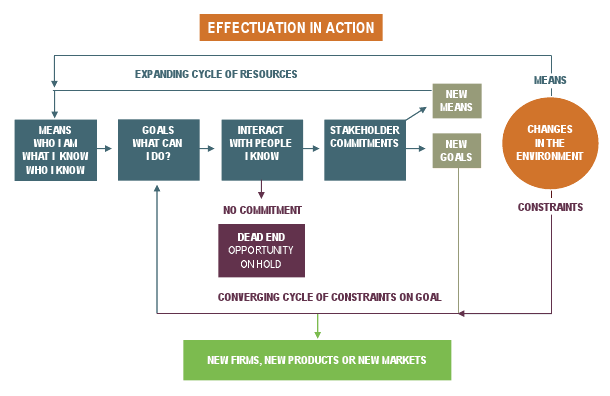 Effectuation and New Venture Performance – How does an effectual approach relate to the outcomes generated by a new venture? Watch the interview with Saras Sarasvathy at BigThink (bigthink.com/users/sarassarasvathy). She discusses entrepreneurial expertise, who becomes an entrepreneur, what the recession means for entrepreneurship, and entrepreneurial thinking and action. Explore effectuation research by perusing our academic paper directory, learn about effectuation research, and see what big questions are still out there in our questions forum. Understanding the context and dynamic changes in US food and agriculture over the last century gives one a broader, and deeper, perspective on your current business ambitions in the sector. We suggest reading The 20th Century Transformation of US Agriculture and Farm Policy by USDA ERS. It is only 12 pages, but summarizes much of what has created the opportunity for innovative new food/agriculture businesses today. Should you be interested in further understand the nature and structure of today’s crop farms as suppliers, see the USDA report Farm Size and the Organization of US Crop Farming. If nothing else, see the table on page 17 that displays the return on equity for various kinds of crop, fruit, and vegetable operations across scale. Lastly, the historical trends are shifting US farm size and what they produce. See the new vocabulary being used by USDA in updating the ERS Farm Typology. We’d suggest skimming, perhaps looking more carefully at the Summary, iii-iv and the Conclusions and Discussion, pgs. 30-32. This is a lengthy look at the changes in food/agriculture toward more regional food systems. Moving Along the Value Chain: Innovations in Regional Food Distribution is long, but deserves skimming and perhaps reading the Summary, Introduction (pgs. 1-8), and Conclusions (pgs. 86-93) section. Should you be interested in the history and evolution of thinking in the US around the emergence of sustainable agriculture, browse the USDA National Ag. Library: Tracing the Evolution of Organic and Sustainable Agriculture website and content. There could be some useful history for use in marketing or positioning of your business. We will be using the SARE Building a Sustainable Business book as a general guide in designing and comparing alternative operations to those that exist and are at scale. This is only for reference should you need the tools to build a business tied to the production side of the supply chain. A good review of alternative supply chains, and how they compete economically with competition is found in USDA Report 99 Comparing the Structure, Size, and Performance of Local and Mainstream Supply Chains. Often counter-intuitive, it looks at fruit, vegetables, meat, and milk cases across the US and how the profit is split among players in the supply chain based on business design. Similarly, Europe has a longer history and use of more local food systems. See their report, Short Food Supply Chains and the Local Food Systems in the EU. A State of Play of their Socio-Economic Characteristics. While long, we’d suggest skimming and looking over the Conclusions (pgs. 13-17) and the Overall Conclusions (pgs. 105-116). One historical alternative business structure often used in agriculture is the cooperative. For references regional to the western US, see the California center collection of resources for determining why, when, and how to develop a food/agricultural cooperative should you be interested in that structure. Finally, there is a vast array of information on small-scale food/agriculture development. For more authoritative information, skim the content found in ATTRA’s Local and Regional Food reference library, the Choices Magazine issue all about local and regional food systems, Farm-to-School resources from USDA library, and Local Food Systems characteristics from USDA ERS.